I would like to know how to make foie gras butter. I have the butter and the foie gras, but want to know if I just whip them together or have to cook the foie gras first? It’s to serve with venison. There is definitely a technique to making this delicate butter. Because you are using this on Venison, I would recommend using 75% Foie Gras and 25% Butter to compliment the gaminess of the Venison. If you were using this with Poultry, I would recommend the opposite. Mix the Foie Gras and Butter in a bowl. Place in a Double Boiler and allow the flavors to melt together and the fat molecules to combine. The Double Boiler is necessary because you do not want the milk solids to break from the butterfat. You want to render the fat of the Foie Gras into the butter, rather than separate. Use a Hand Blender to whip periodically. Place the mixture into the refrigerator to set. Before it hardens completely, give it one more whip by the Hand Blender. You can then use it from a Pastry Bag to make rosettes, or roll it up and slice it to make rounds. Good Luck to you, and feel free to send pictures of the finished product. I finally made the Foi Gras Butter! I’ve attached a photo for you. 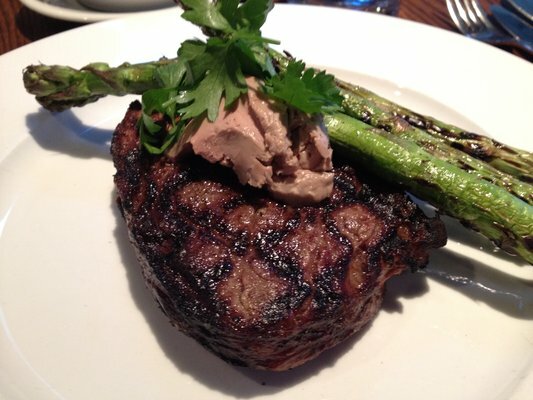 I decided to top a rare Rib Eye with it–it was delicious and everyone loved it! Thanks for taking the time. I couldnt have done it without you! You are currently browsing the Ask The Chef Forum blog archives for February, 2013.